Kirketaket (1439 masl) is voted among the top 10 mountains in Norway for Alpine Ski Touring by the Norwegian Ski Magazine “Fri Flyt”. The skiing up to Kirketaket takes around 3 to 5 hours. From the summit, there is more than 1000 vertical metres (3000 feet) of great skiing down to the mountain dairy of Kavliheian which is situated at the foothill of the mountain. NOTE! Before you ski on Kirketaket and in the Romsdal Mountains, please check the Avalanche Forecast for Romsdal. Kirketaket is a great mountain for alpine ski touring with fjord view. You start at the Shooting Range in Isfjorden (see map at bottom of article). Follow the ski track eastwards up to Stormyra. Cross the flat Stormyra and continue to the left towards Bruhaugen where the ascent starts. Bruhaugen is a popular goal for families with children. Continue up through the forest (north) to the “snow-meter” at Vårseterhjellen. Here you will find a marked pole where you can read off the amount of snow, see below for more info on how to send in the data to Kirketaket.com. Then continue up the forest path from Vårseterhjellen towards Skarsetra Mountain Pasture. Just before you arrive Skarsetra, take up to the right towards Mt. Steinberget. Here, it is steep and heavy, but fairly easy to cross upwards. Cross the flat Steinberget (981m) until the east end and the steep ascent to the top of Steinberget. Then you ski down a small hill to where you start the ascent towards Kirketaket. You follow the ridge up, on the left side, towards Kirketaket. It is normal to cross into the wide mountain side of Kirketaket after the narrow left ridge meets the mountain side further up. Then you cross up the mountain side to the summit at 1439 masl. From the summit you have a fantastic panorama-view towards the Romsdalsfjord and the surrounding mountains. You see the Romsdal mountains towards east and south, the Romsdalsfjord and the Romsdal coast to the west, and the Nordmøre mountains to the north. But best of all; you have more than 1000 vertical metres downhill skiing waiting for you. From the top, there is more than 1000 vertical meters (3000 feet) of great skiing, with a mix of steep and gentle slopes, down to the mountain dairy of Kavliheian which is situated at the foothill of Kirketaket. From Kavliheia and back down to Isfjorden Shooting Range, which normally is the starting point for the trip, there is fun and gentle skiing. 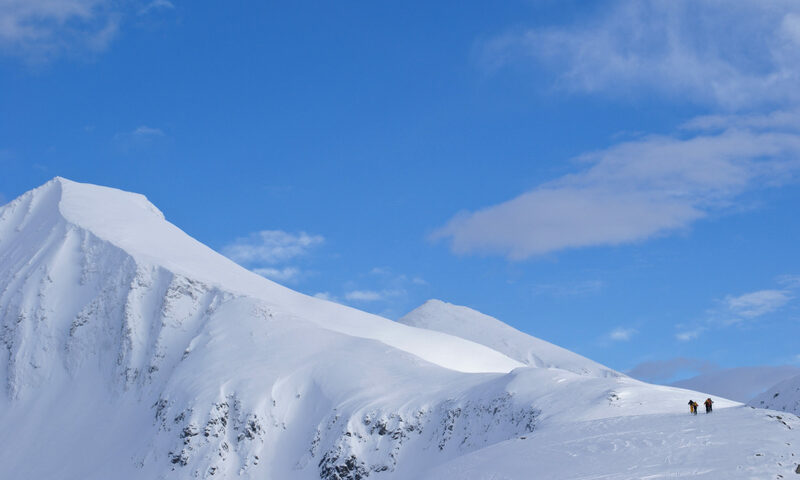 Isfjorden is surrounded by great ski-touring-mountains, and all the mountains have fjord view. We also recommend skiing to Blånebba, Kjøvskardtind, Skarven and Galtåtind. In Isfjorden and Romsdal, Guided Tours are recommended. Hashtag your instagram-pictures from Kirketaket with #kirketaket and they will be displayed here one minute after you post the pictures on instagram. NOTE! The snow can be blown to a large Snow Cornice (Snøskavl) in north direction at the top-ridge. Due to this, never ski further than you can see rocks/stones at the summit of Kirketaket. 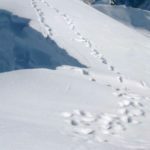 Never ski/walk close towards the edge where you don´t know if you have the mountain or just a snow cornice under your feet. 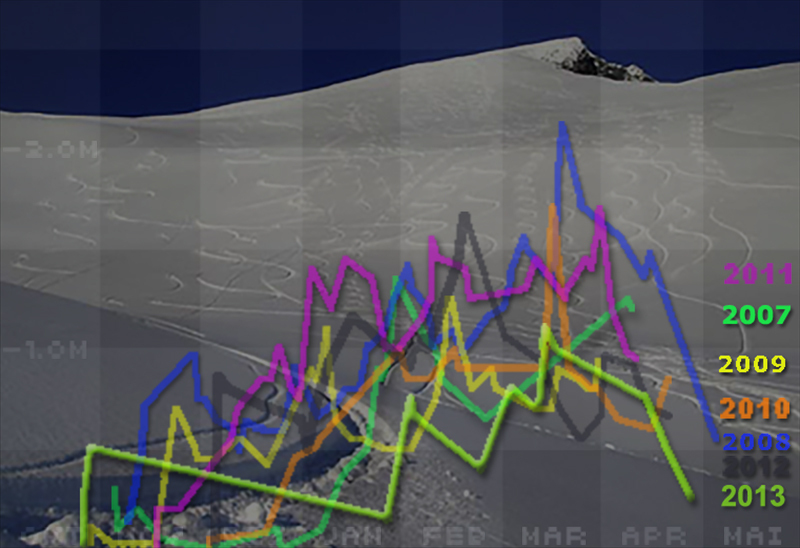 There have been two accidents the last years where skiers have been skiing too close to the edge. 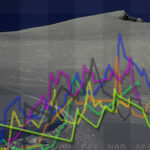 They fell through the snow cornice and down the north face of the mountain, and one of the accidents was unfortunately fatal. 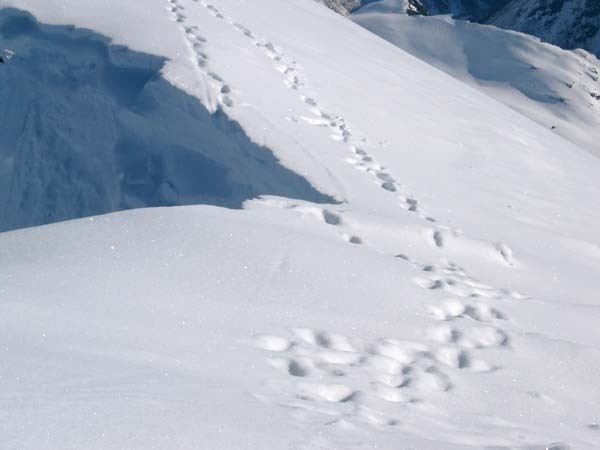 Left picture: One day before the picture was taken, a person left these tracks on the Snow Cornice at the summit of Kirketaket. The day after, the snow and the tracks had disappeared. The person that walked there probably do not know it, but should be very lucky to be alive today! There are also danger for avalanches at Kirketaket. Always check the Avalanche Forecast for Romsdal before skiing to Kirketaket and the Romsdal Mountains. Between 2007 and 2013, the skiers sent in the Snow Heights at Vårseterhjellen (300 masl), at the foot of Steinberget. Click on the picture to the left to see how much snow we had these years. 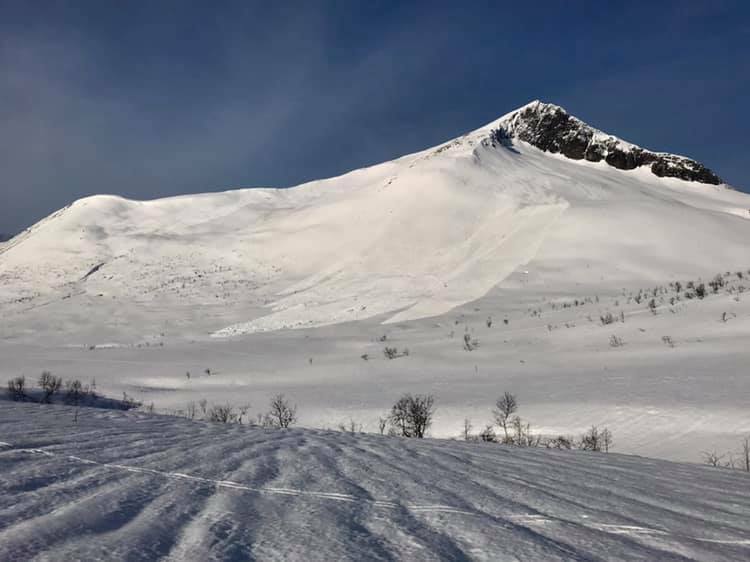 15 Feb 2019 – Big avalanche at Kirketaket today, towards Kavliheian Mountain Pasture at the base of Kirketaket. Reported and Picture by Liv Kjølen Eriksen. 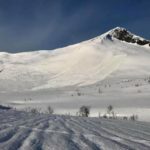 Så be careful and always check the Avalanche Forecast for Romsdal before skiing in Romsdal. Kirketaket and the surrounding mountains are also great for hiking. You can hike the same route as in wintertime, via Steinberget and then up Vesteggen to the top. Another great hike is Hesteskotraversen (Horse Shoe Traverse) via Vetle Klauva to Klauva and then up the ridge to Kirketaket. This is a longer and heavier hike and does not require climbing gear if the mountain is dry. This route is exposed between Klauva and towards the summit of Kirketaket. The pitures below taken from the Vengedalen Valley, and most of the route is visible. Vetle Klaura and Klauva to the left and Kirketaket to the right. Kirketaket is very ‘rocky’ which results in quite a tough hike down. Guided Tours are recommended. You can reach Isfjorden by car, 6 hours from Oslo or 4 hours from Trondheim. 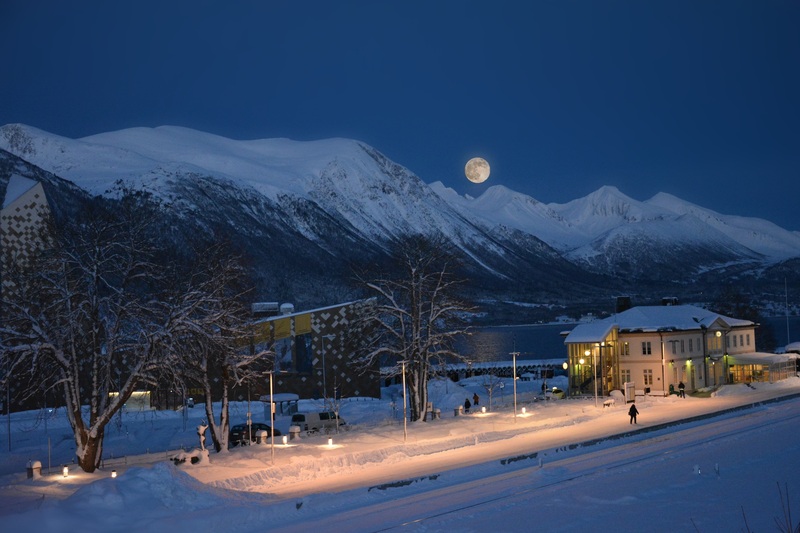 By train to the end-station Åndalsnes at one of Norways most spectacular railways, Raumabanen. You can see Isfjorden and Kirketaket from Åndalsnes Railway Station (Left Picture, Photo @jarek777). 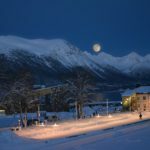 From Åndalsnes, it is only a short Taxi-drive to Isfjorden Shooting range, the starting point of the Kirketaket ski trip. The nearest airport is in Molde, then one hour by bus to Isfjorden.